You have just put the groceries in the car, you still have to pickup the kids at baseball practice. As you are backing out of your parking spot, a car slams into the side of your car. You have just been the victim of a parking lot accident. Did you know that 20% of all accidents happen in parking lots? These types of accidents generally happen at low speeds, don’t usually result in serious damage or injury BUT can still cause you to be surcharged which in turn raises your auto insurance rates. The first step is to always contact the police regardless if there seems to be no damage or injuries. File a police report. Months down the line the other operator may claim neck injuries or damage to their car. Settling an accident with the other driver without filing a claim with your auto carrier can backfire. If you give a check to the other party they can use your check as proof that the accident occurred and now they might want you to pay for their medical expenses. Notifying the police and the insurance company shifts your liability to your Massachusetts Auto Insurance carrier in the event other damages come up later. In addition to notifying your insurance carrier and the police follow thes simple five steps if you are involved in a parking lot accident. 1. Stay Calm! When a parking lot accident occurs never admit it was your fault and don’t argue over who i was at fault. Just exchange names, addresses, phone numbers and insurance information. The insurance companies will determine who was at fault. 2. Find Witnesses Look around for witnesses to the accident and ask whether they would be willing to furnish a name and contact number. 3 Document the scene. Don’t move the vehicles until you take pictures. Photograph the skid marks, if any, along with broken glass or debris. Use your smartphone or keep a disposable camera in the glovebox. Take pictures to show the routes of travel, where you were – all befoe you move the cars. When you get home diagram what occurred to provide to your insurance agent. * Pull into a parking spot where you don’t have to back up but can instead pull forward into the lane of travel. * Before buying a car test it extensively for blind spots. 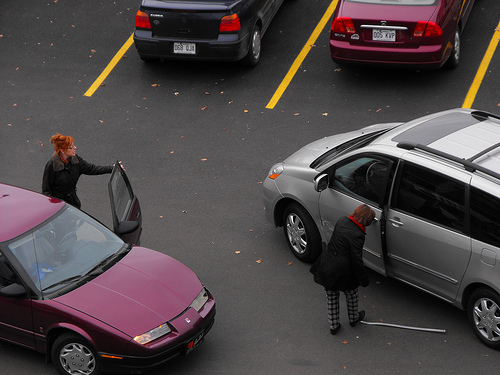 * Watch for wind gusts when opening car doors, as they can cause the door to fling open striking the car next to you. * Don’t park so close to the door of the store, everyone always looks for the spot closes to the entrance. High traffic means higher percentage of getting into an accident. You are currently browsing the Koinsurance's Blog blog archives for April, 2011.